Goodell Gardens is proud to join Common Roots, Community Wellness Initiative at Allegheny College, Edinboro Market, Edinboro University, Students of Edinboro for Environmental Defense (S.E.E.D. 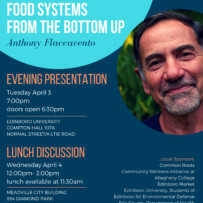 ), Erie County Department of Health, Meadville Market House, My Meadville with the Meadville Redevelopment Authority, and Whole Foods Co-Op of Erie to sponsor two events with Anthony Flaccavento. Evening Presentation: Tuesday, April 3, 7 pm (doors open at 6:30 pm) at Edinboro University Compton Hall Room 107A (E. Normal St. & Kiltie Rd. ), Edinboro, PA 16444. Lunch Discussion: Wednesday, April 4, 12 noon - 2 pm (lunch available at 11:30 am) at the Meadville City Building, 894 Diamond Park, Meadville, PA 16335. For more informatin, email Marti at ediboromarket@gmail.com, or call Kerstin at (814) 332-2787.